Dr. Michael Graham is director of research and development at the Moss Landing Marine Lab’s Center for Aquaculture. Click here to read the Monterey County Weekly's article on Monterey Bay Seaweeds. 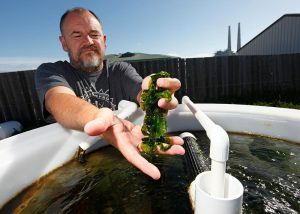 Michael Graham harvests sea lettuce from his ocean-fed Moss Landing tanks. ← Santa Cruz Sentinel: Aquaculture: The next great Monterey County frontier?